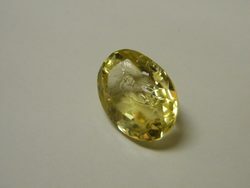 A stone cherished by her Mom, but never worn again after it chipped. Her daughter was open to unusual design suggestions incorporating the birthstones of children and grandchildren. The result? 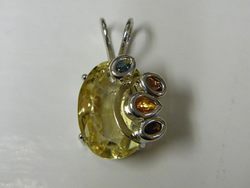 This one of a kind pendant has bezel set stones plus a yellow gold bar creating a two tone effect. And the best part is you can barely see the chip! She couldn't wait to give it to her Mom for Mother's Day.